When we’re forced to sit and eat with someone who chews with their mouth open it can be a disgusting moment in time. When a Slow Loris eats with their mouth open it’s a far more adorable and view worthy event. YouTube user SlowLorisChannel (yes it’s a real channel and it’s glorious), recently posted a video of a Slow Loris chewing up a small piece of banana. It’s obvious that the little guy loves their treat. Just when we thought it was over, he slowly crawls over to another piece of banana and the process starts all over again. Watch this Slow Loris eating a banana and your day will be officially complete. 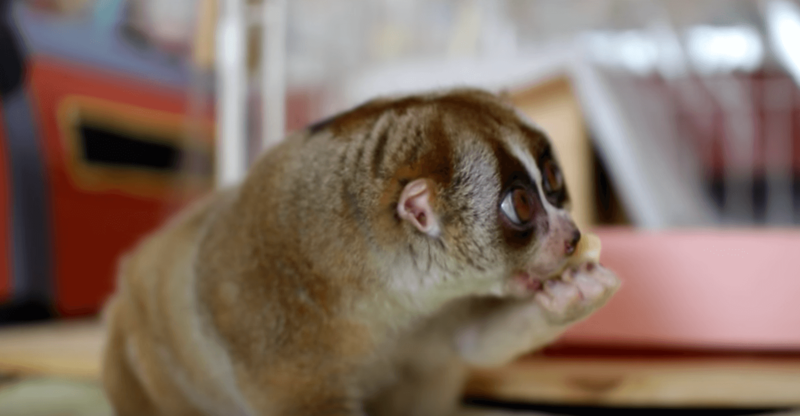 Share this Slow Loris clip with your friends and then go eat a banana — you know you want to.